Manuka Oil is extracted from the leaves and small branches of the Manuka tree (Leptospermum scoparium) which is native to New Zealand. The indigenous people (Maori) of New Zealand have been using Manuka oil, its bark, sap, teas and poultice made with its leaves for centuries in the treatment of many health conditions. Recent research suggests that Manuka Oil contains Sesquiterpenes, Triketones, particularly Leptospermone, Isoleptospermone and Flavesone which give it extraordinary antimicrobial activity. Research has also found that the synergistic effects of Triketones and Sesquiterpenes may be attributed to the high anti-bacterial, anti-fungal, anti-septic and anti-viral activity of Manuka oil. Therefore, it is not surprising that this oil is often used in modern skin care products, body oils, creams, antibacterial lotions, and soaps and shampoos. What are the Benefits of Manuka Oil? Studies suggest that the anti-bacterial, anti fungal, anti-viral, anti-septic and anti-inflammatory activity of Manuka Oil may help in the treatment of a broad spectrum of health conditions. Manuka Oil has been used therapeutically in the treatment of rheumatic conditions, muscle aches, joint pains, back ache, arthritis, sport injuries, dandruff, fleas, lice, body odor, nasal congestion, gingivitis, diarrhea, dysentery, urinary conditions, skin infections, foot conditions such as Athlete's Foot, nail infection, and foot odor. The oil is also widely used in aromatherapies to relieve stress and anxiety. A recent research study showed that Manuka Oil may also be effective against antibiotic resistant MRSA (Methicillin-Resistant Staph. Aureus) bacteria and gram bacteria such as Staphylococcus and Streptococcus as well as Pathogenic Fungi. Research performed at the Cawthron Institute of New Zealand suggests that Manuka Oil may eliminate a variety of bacteria, yeasts and fungi which can cause Athlete's foot, Toenail Fungus and other foot infections. Therefore, an excellent home remedy for foot infections is to apply Manuka oil directly onto the affected feet twice daily and cover them with fine cotton fabric or cotton socks. Also soaking the feet in a Manuka Oil soak may help inhibit the progression and development of any fungal infection. To make a Manuka Oil soak, simply add 10 drops of Manuka Oil in 2 quarts of lukewarm water and soak the infected feet for about 15 minutes. Repeat this four to five times a week. Studies show that along with its antibacterial, antiseptic and antimicrobial activity, Manuka Oil has remarkable soothing and relaxing effects on the human psyche. According to a German Aromatherapist, the oil is beneficial for people who suffer from stress, anxiety, and have an over-sensitive nervous system. It refreshens and enlightens human feelings and attitude, and has very calming effects on the human soul, mind and heart. Manuka Oil may also help relax the nerves in the outer layer of the skin and rejuvenate them by activating and regenerating the cells of the outer skin. Therefore, for stress and anxiety, aromatherapy using Manuka essential oil may create an uplifting environment and neutralize pathogens in the air. Manuka Oil contains stable component, Triketones, therefore it can be combined with other stable essential oils like lemon, red mandarin and tangerine which can be very relaxing, uplifting and tranquil for the body and the mind. Therefore, when feeling down and under stress, simply diffuse Manuka essential oil in your room and relax in your bed or easy chair and breathe in through the nose and breathe out through the mouth. This breathing exercise relaxes the strained muscles of the body. Also playing your favourite spa music can add to the calming environment. Natives of New Zealand have been using Manuka Oil for aching and stiff joints, strained and painful muscles, back aches, and arthriti pain for centuries. Massaging lukewarm Manuka Oil onto the stiff, inflamed and painful muscles, joints or bones may help relieve the symptoms. Also taking a bath in Manuka Oil mixed water may soothe and alleviate the pain and stiffness. Simply add 10-15 drops of Manuka oil into the bath water and soak in it for 15-20 minutes three to four times a week. Manuka Oil is believed to be beneficial for foot and body odor. For body odor, adding 3 to 4 drops of Manuka oil into your body wash or 10 drops into the bath water can minimize strong body odor. For foot odor, washing the feet with Manuka Oil soap and soaking them in about 2 quarts of lukewarm water mixed with 6-8 drops of Manuka Oil daily may reduce the foot odor. Also applying mild Manuka Oil thoroughly on the feet and in between the toes every day can eliminate the odor as well as any possible fungal infection which may be the cause of foot odor. 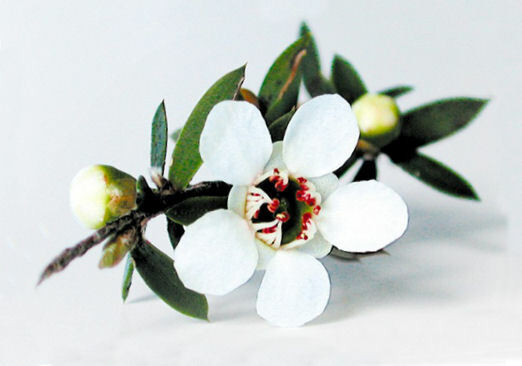 Manuka Oil has been used in the treatment of dandruff, itching scalp, fleas and lice. An effective home remedy for dandruff, itchy scalp and head lice using Manuka Oil is to add 2-3 drops of the oil into your regular shampoo and conditioner and wash the hair as normal. Two drops of Manuka Oil can also be diluted in one tablespoon of Organic coconut oil and be massaged into the hair and scalp thoroughly at least 15-20 minutes before the shower and then washed as normal. A recent study showed that inhaling the vapours from Manuka tea may help with respiratory conditions such as nasal congestion, asthma, cold and flu, and cough and bronchitis. Using a wide pot, simply add two tablespoons of Manuka leaves to one quart of boiling water and let it boil for 4-5 minutes. You can then turn off the stove, and then cover your head with a towel and inhale the steam for about 5 minutes. If you prefer to use Manuka oil instead of the leaves, simply add 1 tbsp of Manuka oil into one quart of boiling water to achieve the same effect. A clinical study suggest that Manuka Oil may have great antimicrobial activity against a wide range of micro-organisms. Therefore, researchers believe that Manuka oil may be beneficial for a number of skin conditions such as acne, blemishes, pimples, skin rash and itchiness, small cuts, chafing, eczema, psoriasis, ring worm, cuts, abrasions, sunburn, insect bites, boils, and sores including bed sores and canker sores. A suggested remedy is to apply a small amount of mild Manuka oil directly onto the affected skin three to four times daily. For acne treatment, 1 or 2 drops of Manuka oil can be added to regular face-wash and moisturizer. To draw out the pus from boils and to heal sores, application of a poultice made by 2 tbsp of crushed leaves soaked in 2 tbsp of lukewarm water have shown to be beneficial. Manuka Oil also possesses insecticidal properties which may inhibit the diffusion of toxins and reduce the infectious reactions of stings and insect bites. Its analgesic and anti-inflammatory properties may also soothe the irritation and inflammation caused by insect bites and other infections. For insect bites, simply apply Manuka Oil immediately onto the affected area. If you are using Manuka Essential Oil, dilute it in almond oil or water because undiluted essential oils are highly concentrated and can be harsh on the skin. Manuka tea has been reported to be effective for bladder infection and Urinary Tract Infection. For UTI, drink Manuka tea 2 to 3 times daily. Manuka tea can be prepared by steeping Manuka leaves for 5-7 minutes into one cup of boiling water. What are the Side Effects of Manuka Oil? There are no known major adverse side effects of Manuka Oil when used in moderation. However, it is possible that some people may be allergic to Manuka Oil. Therefore, if you notice any skin rash or itchiness, stop the use of this oil immediately and consult your doctor. Manuka Oil, its creams, honey, and essential oils are available at most health food stores. Manuka Oil is available in mild, pure and essential oil form. It is also being added to antibacterial hand and body washes, soaps, shampoos and conditioners, and facial masks, peels, cleansers and creams. When buying, look for Manuka Oil from the East Cape region of New Zealand since research has found that samples of Manuka Oil from that region contain higher levels of trikenones and hence higher antimicrobial activity than the samples from other regions of the world. Find some simple techniques to naturally reduce body odor. Learn how to naturally treat this common scalp condition. Clear your stuffed nose and sinus problems naturally. Can Manuka oil be used on dogs with fleas? Is Manuka oil good for gout?